This chapter introduces the idea of attitude determination and control as a geometrical problem on the two-dimensional celestial sphere, describes the most common attitude coordinate systems, and summarizes geometry on the celestial sphere. Recall that the spacecraft attitude is its orientation relative to the Sun, the Earth, or the stars regardless of the distances to these various objects. 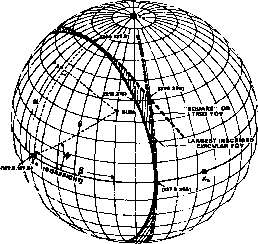 To think in terms of direction only, it is convenient to form a mental construct of a sphere of unit radius centered on the spacecraft, called the spacecraft-centered celestial sphere, which is illustrated in Fig. 2-1. A point on the sphere represents a direction in space. For example, in Fig. 2-1, the points S, E, and A are the directions of the center of the Sun, the center of the disk of the Earth (called the nadir or subsatellite point), and the spacecraft attitude, respectively, as viewed from the spacecraft. The points E and 5 on the sphere are both a unit distance from the spacecraft, although the real distance to the Sun and the Earth is vastly different in most cases. Point A corresponds to the direction of a specific spacecraft axis which has no distance associated with it. As standard notation throughout this book, we represent points on the celestial sphere by uppercase italic Roman letters. Points on the sky diametrically opposite a given direction have a "—1" superscript and are called the antipoint when speaking of a point on the sphere or the negative axis when speaking of the direction of an axis or vector. Thus, 5 ~1 is the antisolar point and A ~1 is the negative attitude axis. The antinadir, E ~ \ or direction opposite the center of the Earth, is called the zenith. After Fig. 2-2, the spacecraft at the center of the sphere and the lines from the center to the surface of the sphere will be omitted and we will speak of geometry on the celestial sphere. celestial sphere. We will discuss the properties of great circles and spherical triangles in more detail in Section 2.3. Linear measure, such as metres, has no meaning on the celestial sphere. In general, there are only three types of measurements on the celestial sphere—arc length, rotation angle, and solid angle—and it is important to recognize the distinction between them. 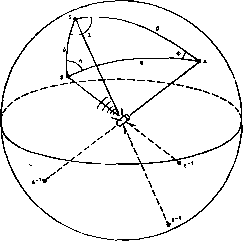 The lengths of the sides of a spherical triangle (j3, ij, and tj/ in Fig. 2-1) are arc length measurements (or angular separations), measured in degrees or radians. The terms Sun angle and nadir angle (and symbols ft and ij) are used for the arc lengths from the attitude to the Sun and to the center of the Earth, respectively. The angle at which two arc segments intersect (O, 2, or A in the spherical triangle of Fig. 2-1) is called a rotation angle and is also measured in degrees or radians. Although arc lengths and rotation angles are measured in the same units, they are different types of quantities and are not interchangeable. Throughout this book, arc lengths will be represented by lowercase Greek letters and rotation angles by uppercase Greek letters. The area of the spherical triangle measured on the curved surface of the unit sphere is an example of the third type of measurement, the solid angle. Solid angles are measured in square degrees or steradians and will be represented by uppercase Greek letters. Appendix A gives area formulas for most common shapes on the celestial sphere. An alternative procedure for thinking of angular measure is in terms of lines and planes from the spacecraft to distant objects. Thus the term cone angle is frequently used for arc length, since the angular radius of a cone about a central axis is an arc length measurement. Similarly, the term dihedral angle (the angle between two planes) is frequently used for rotation angle, since, for example, the rotation angle 4> is also the angle between the spacecraft-Sun-attitude plane and the spacecraft-nadir-attitude plane. Finally, it is important to recognize that arc length on the celestial sphere measures the angular separation between two objects as seen from the spacecraft. Thus, the arc length from the Sun to the Earth, \p, is the angular separation in the sky between these two objects. For convenience in thinking of angular separation, note that 1 deg (1°) is approximately the angular diameter of a dime at a distance of 1 m; 1 minute of arc (l'= l/60th of 1°) is the angular diameter of a dime at 60 m; and 1 second of arc (1" = 1 /60th of 1') is the angular diameter of a dime at 3.6 km. The angular diameter of both the Moon and the Sun as seen from the Earth is about 1/2 deg. To make measurements on the celestial sphere, it is convenient to use a spherical coordinate system. The general properties of any such system are discussed in Section 2.2.1, and specific examples of the most common spherical and rectangular systems used in practice are discussed in Sections 2.2.2 and 2.2.3. 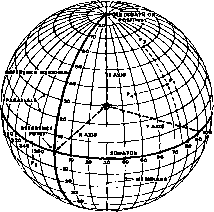 The spherical coordinates are defined in terms of the unit celestial sphere. All of these may be transformed into three-dimensional coordinates by the addition of a third variable, r, the distance from the center of the coordinate system to the point in question. The spherical coordinate systems normally used for spacecraft have a number of properties in common. These are illustrated in Fig. 2-2 for the spacecraft-centered celestial sphere described above. Each spherical coordinate system has two poles diametrically opposite each other on the celestial sphere and an equator, or great circle, halfway between the poles. The great circles through the poles and perpendicular to the equator are called meridians and the small circles a fixed distance above or below the equator are called parallels. Which attitude is called as great circle? What is attitude number co ordinate jeometry?